Xia Boyu, 69, sat cross-legged on his hospital bed in Beijing, his fingers and face bound with gauze, as baskets of flowers piled up next to his leg prostheses. As far-fetched as it may sound, and decades after his first attempt, the climber had finally achieved his life’s dream of making it to the summit of the world’s tallest mountain, Mount Qomolangma, known as Everest in the West. Xia had been basking in the media spotlight ever since he’d been admitted to hospital. He delighted in sharing his mountain-climbing exploits with journalists from China and abroad, unlikely though they were. In 1975, on his first expedition to the roof of the world, the 26-year-old lost both his feet to frostbite. 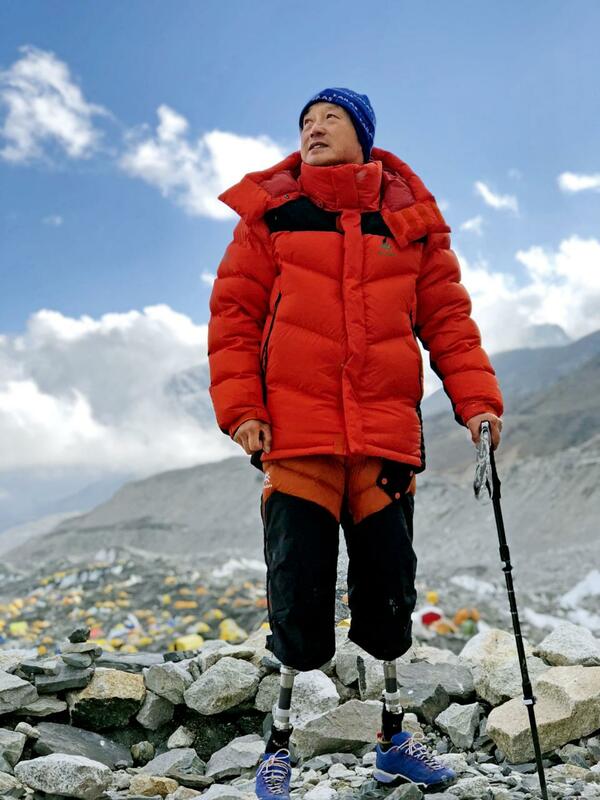 More than four decades later on May 14, 2018, and a double amputee, Xia finally made the summit of Mount Qomolangma. He was the first Chinese double amputee to achieve the feat. “I wasn’t so excited then because I knew the day would come,” he told NewsChina. Xia said he had already decided what pose he would strike at the summit, planning to point up at the sky while holding the Chinese flag. But when he reached the peak, other climbers were eager to snap photos with him, then suddenly bad weather hit and the climbers were forced into a hasty descent. Xia’s only regret is that he did not have time for an individual photo. Even this descent was not injury-free. His glasses were covered by ice, and he had to take his gloves off to clear them. But although it only took seconds, it was already too late. Ice and snow were inside his gloves, and his hands were affected by frostbite. As soon as he arrived back in Beijing, he was admitted to hospital for treatment. “I never imagined I’d reach the peak this year. Nobody would dare think it,” he said. He’d tried several times since his first ill-fated trip. Before every attempt, he’d promised his family it would be the last. He would tell his wife about his insurance policy, and remind her to pay the bills on time. Growing up in Northwest China’s Qinghai Province, Xia first dreamed of becoming a soccer player. He graduated from a sports school and became a regular worker. “At that time, you were proud of being a worker. But I was still a great fan of sports,” Xia said. In 1974, China’s national mountaineering team came to his factory to select climbers and he was chosen. It was then that the first seeds of ambition were planted to climb the world’s tallest mountain, measuring 8,848 meters above sea level. It was to become a lifelong pursuit. Just one year later, Xia went on his first trip to the Himalayan peak, on the border between Nepal and the Tibet Autonomous Region, part of a team of 100 climbers. The expedition was hit by disaster after a snowstorm struck at a height of 8,600 meters. Marooned for several days on the mountain, some of the team died of exhaustion, oxygen deficit and shortage of food. They eventually made the decision to descend. A climber lost his sleeping bag and Xia offered his to him. Xia later found that he could not take off his shoes and after he made it down the mountain, his feet turned pink and then black. When he arrived back in Beijing, he was told both his feet would have to be amputated. His doctors told Xia that if he were to use prostheses, they would need to take part of his leg as well, usually two-thirds of the way from the knee. But he refused at first. He still wanted to play soccer, so he asked doctors to only amputate his feet. But then he started to think he could still be a climber. “I think my physique, resistance to the cold and adaptation are perfectly suited to mountain climbing. It is an adventure of excitement and challenges,” he said. “You encounter ice crevasses and extreme weather,” he said, pointing out that despite the dangers, there is a lot of protective equipment. He was also fascinated by the primal contact with nature. In 1975, a German medical expert examined Xia. He insisted that Xia could lead a normal life, even climb again with prostheses. Many people had doubts at that time, but Xia had faith. Eight years after he lost his feet, his son Xia Dengping was born. Xia Dengping has lost count of how many operations his dad has had to endure. He told our reporter that after 1975, his father insisted on training and his wounds would often bleed. Xia Boyu cycled to work each day and his prostheses often fell off his bike. Xia confessed that he used to complain about the unfair hand life had dealt him, but eventually he accepted his fate as a double amputee. But worse was to come – in 1993 he was diagnosed with lymphatic cancer. He was staying in a hospital ward of six patients where groans and sighs of despair resonated. Reluctant to stay there, he discharged himself, cycling back every day for treatment. But the treatment worked, somewhat miraculously, and Xia has remained healthy to this day. The amputation in 1975 and the diagnosis of cancer in 1993 were the worst periods of Xia’s life, but he rarely talks about them. “They are really lengthy processes,” he told our reporter. In comparison with his suffering, he is eager to talk about his career in mountain climbing. In 2014, Xia Boyu went to Nepal to embark on his second trek to the world’s highest peak. Journeying up the mountain turned out to be extremely difficult for Xia on his artificial legs. It was hard for him to feel the ground and he had to put most of his weight on his arms, which exhausted him more than other climbers. But then a fatal avalanche hit the notorious Khumbu Icefall while local Sherpas were preparing the route for paying clients. Sixteen Sherpas were killed, and the Nepal government banned climbing for the rest of the season. The following year Xia returned for his third attempt. This time, base camp was hit by the deadly magnitude 7.8 earthquake that devastated Nepal. Xia was lucky to survive; 21 climbers died and dozens were injured. Many were stranded on the mountain for days. Xia was undeterred. “If I’m alive, I’ll continue my journey,” he said. In 2016, he reached a height of 8,785 meters, less than 100 meters short of the peak. A storm, however, forced them to turn back, which was the most difficult decision he’d ever had to make. “If it weren’t for the safety of my five young guides, I would have rushed to the top, even if it cost me my life,” he said. Meanwhile, the Nepal government banned people with disabilities from attempting the mountain in order to reduce accidents. In 2017 alone, more than 600 people made it to the top and at least seven died. The ban was later overruled by Nepal’s top court over discrimination against the disabled after advocacy from human rights groups. Xia became the first double amputee to be given a permit to climb Mount Qomolangma after the ban was revoked. To toughen himself up for what would ultimately become his last, successful attempt, in 2017 Xia trekked through the Tengger Desert, the fourth-largest desert in China, which is largely in the Inner Mongolia Autonomous Region. He went to the Gobi Desert in western China and learned cliff-climbing, simply to prepare for his fifth summit attempt. Xia made detailed training schedules with more exercises. He got up at 4am every morning to hike the Fragrant Hills in western Beijing after his strength training. Meanwhile, he was diagnosed with blood clots and doctors told him he should not attempt the mountain again. “You can’t believe everything a doctor says,” Xia said. Once again, he proved them wrong. Xia likes to take notes on his trips to record what he sees and feels. He plans to publish his account of his story – after he gets out of hospital again. His son Xia Dengping says that mountain climbing has a completely different meaning to his father. “I don’t think my father likes mountain climbing,” he said.